This is a really nice, comparatively easy meal. The lamb meatballs are simply made, soft and spicy. Because they only have pepper in them, the delicious flavor unique to lamb really comes through. The eggplant puree only adds to the experience of the meatballs. In the “gull” corner, the stuffing is what really makes it special. The fennel stays a little crunchy, providing a nice textural counterpoint to the flavor combo of the other ingredients. Pop a few grapes for dessert, and you’ll be feasting like a pirate king. Our changes: We substituted oil for the sheep fat. While something might be lost in flavor, it is no doubt made up for in the ease of obtaining the ingredients. We also added Aleppo pepper to the meatballs. If you’ve not tried this terrific pepper, you are missing out. It can be found in some large grocery stores, and in Middle Eastern markets. In a large covered saucepan, boil the eggplant for five minutes in water with salt. Let it drain, cool and dry. Heat oil in a skillet or saucepan and add the boiled eggplant. Cover, and stew the eggplant over a low heat with the lid on until it is very soft. If need be, turn the eggplant a couple of time, cooking for about 15 minutes. Remove from stove. Pull the skin off the eggplant, and mince the flesh with a fork or in a blender. Temper to taste with yoghurt, garlic, salt and ground coriander. Mix the ground lamb with the Aleppo pepper, and roll into small disc-shaped meatballs. Choose a casserole in which the balls fit snugly. Heat sheep fat or oil, fry the meatballs until they are brown. Pour enough water in to cover the balls. Let it simmer for around 5-10 minutes, then check one of the meatballs to see if it’s done. Add the eggplant sauce to the meatballs, heat through. The modern cook would add some salt and pepper to the meatballs. Cook’s Notes: Given the lack of readily available gulls in our local markets, we decided to swap in some Cornish game hens. 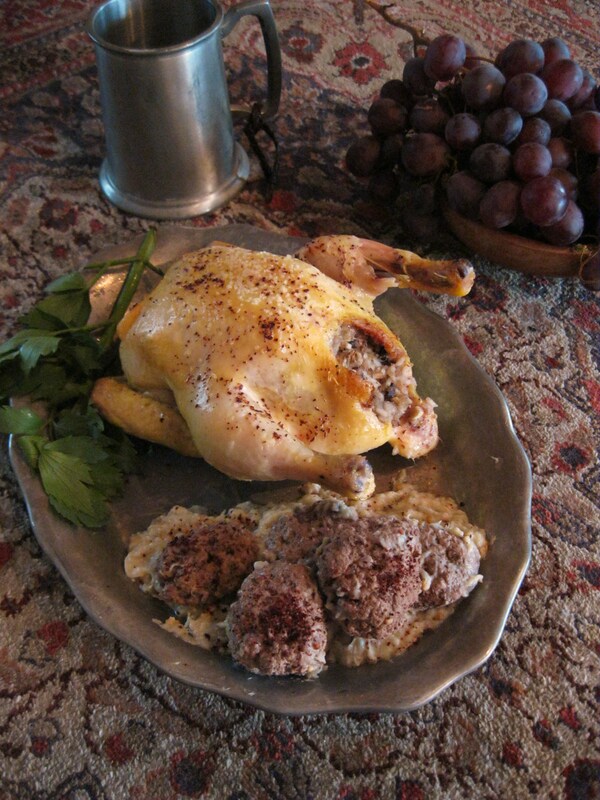 A chicken could also be used, but the game hens provide a slightly quirkier presentation. They have a slightly different texture from chickens as well. Preheat oven to 350 degrees. Cut up and combine the mushrooms, fennel, onion, and garlic. Toss with some olive oil and salt, spread out in an oven safe dish, and roast for about 15 minutes. While the stuffing is in the oven, make some rice or couscous according to the directions on their package. Rub the game hens with olive oil and salt them. You may also sprinkle with a little pepper, if you like. When the rice/couscous and the vegetables are both done, combine them and stuff the game hens with the mixture. Cook the hens for about 1 hour and 15 minutes, or until the juices run clear and they are a nice golden color. As you can see the meat is quite different from what you would have gotten from the cornish hen or a chicken, and like the muttonbird I feel a gull would taste of the sea. Would there be anything like these in the US that you could have tried? Not that I know of! Unfortunately, we’re fairly limited with regards to unique meats! We considered a goose or duck, but wanted to keep the expenses down and make it accessible to more people. If anyone with access to different birds wanted to try this recipe out, we’d love to hear how the meal changes! I’ve actually found myself using the stuffing in regular old roaster chickens. Maybe not the same as the book, but an awesome use of parts of the recipe. Even my family members wary of fennel’s licorice associates really enjoy it! The flavors and textures just work so well together. My Uncle was in the Marines during world war ll and the island he was on sometimes did not receive needed supplies of food on a regular basis. He told me they ate sea gull when nothing else was available and it tasted like a tough old rooster and had the smell of stinky dirty feet, and truthfully there was not much meat on them. He said it was a lot of work for a bit of stringy tough meat but at the time they were thankful to get it! Cornish hens are so festive. I love the idea! Question on the lamb. Do you feel they were tender enough, without the addition of breadcrumbs and egg, as in traditional meatballs? I love the taste of lamb, and hate to dilute it, but in retrospect, do you think that is something you might change? You know, I worried the same thing about the meatballs, but because they’re sort of stewed in the water/oil mixture, they come out fairly moist. Sounds like a perfect GoT Sunday dinner! Fantastic. Thanks for letting me know! First of all, I want to beg your forgiveness in that I am a laymen in the field of culinary arts so I hope you can indulge me. I am a bit confused in regards to the eggplant puree and the lamb meatballs. For the puree, after boiling the eggplant, you say to “Heat oil in a casserole and stew the eggplant on a very slow fire with the lid on until it is very soft, about 15 minutes”. Did you mean putting it in a casserole dish and putting it in the oven? Or would frying it on the stove top in a sauce pan with a lid work just as well? Also, for some odd reason, I cannot find Aleppo pepper in the city I live ANYWHERE. I tried looking up substitutes and I found a site that said you could use 3 parts sweet paprika and 1 part cayenne pepper. Don’t suppose you could tell me if this substitute would take much away from the flavor of actual Aleppo pepper? Hi! I’d say that pepper substitute would work pretty well, actually. Aleppo pepper has a sort of slow burn kind of warmth, but with a nice flavor also. As for the eggplant, you can stew it on the stovetop in anything you’ve got that works. I apologize for the lack of clarity in the directions; I’ll fix that asap! Did you consider bulgar wheat instead of couscous or rice as a binder? I think it would add a more interesting texture and greater flavour. Bulgar would also work very well in this recipe. We chose rice/couscous because it struck us a slightly more foreign than bulgar, just like Salladhor Saan is not from Westeros. Something like bulgar wheat would be extremely well suited, in our opinions, to Winterfell. However, the key to many of these and other medieval recipes is innovation, so feel free to experiment! That Persian eggplant puree sounds a lot like Baba Ghanoush… except that this is made by grilling the eggplant and then also adding tahina (crushed sesame seeds) rather than cooking it and frying in sesame oil. Should work just as well.